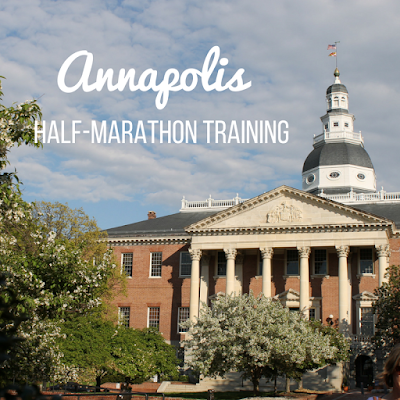 My last post about my training for the Annapolis Half Marathon was all about making time to run. In a way, I almost feel like I jinxed myself by writing that post because, that week, it seemed almost impossible to make time to run. I also just felt really tired all week and by Friday, I was down and out with the flu. I was supposed to run 8 miles that weekend but instead, I spent half the weekend sleeping and trying to recover. I even missed a work trip to Indianapolis that I had been looking forward to for months. On Thursday, I was feeling a little bit better and my colleagues and I headed deep into the Eastern Shore of Maryland for an overnight retreat. It was a lot of fun, but it was pretty exhausting. I got home Friday night and decided to see how my lungs were feeling for a run on Saturday. I managed 3.5 miles and planned for 8-10 early yesterday morning but I was exhausted and slept in. I had an acupuncture appointment and brunch plans with a friend and by the time I got home, I was exhausted and my knee was bothering me. I opted for some at-home yoga which seemed to be exactly what I needed. With three weeks until Race Day, I'm a little bit nervous that I haven't gotten in these key runs but at the same time, I feel like I've been sidelined by something like this almost every time I've trained for a race. I'll be traveling a lot over the next two weeks so it'll be super important to make time to get those runs in but I do still think I'll be in good shape on Race Day! I just need to stay focused to get there! What do you do when you get sidelined from training?